Once being led into the Club Academy venue by staff, DEAD PRESS! are told to wait a few minutes while the band’s tour manager sorts a few things out for tonight’s show. A few minutes later, he guides them backstage to their dressing room, where some members of Forever The Sickest Kids are currently in the middle of eating their afternoon lunch. Zach: How’s the tour in the UK been going so far? Austin: It’s not true at all. They are nuts, and we love it. Zach: How’s the reception been so far for your debut album? Marc: It’s been good, I mean coming over to a place that you’ve never been and hearing kids scream the words is definitely an exciting thing. Zach: Where did the band name come from? Kyle: Well, that’s erm, the true story we like to keep a secret, but erm, overall we wanted a name that would like be different from everything else, and that’s something that kinda sparked curiosity and interest, you know, and erm, so when we thought of Forever The Sickest Kids, like it was so different from everything else that we just wanted the name itself to stand out and at the same time speak for our personalities. Zach: You recorded a cover of ‘Men In Black’ for the ‘Punk Goes Crunk’ album. What made you choose that song? Austin: We didn’t have a choice really. Zach: Cool. Would you say it’s better than the Will Smith version? Marc: No way! You can’t better than Will Smith, you know? He’s the best. Austin: You can’t downgrade Will. Kyle: Do you like Will Smith? Zach: I do like Will Smith. Austin: Are you a fan? Have you seen Men In Black? Zach: I have seen Men In Black. Kyle: He has â€“ he has like more number one songs in America. He’s like one of the best rappers. Zach: His films aren’t bad too, like, have you seen Hancock? Marc: Oh quick, I’d like to add something. Marc: Erm, Kyle cried when he saw â€“ what is it? The movie with Will Smith that you cried in? Marc: No, no. The one before that with the little kid â€“ with his kid. Zach: It doesn’t have a kid in I Am Legend, does it? Kyle: The one where his dog dies? Steph: The Happiness Of Pursuit â€“ The Pursuit Of Happiness? Marc: The Pursuit Of Happiness! Kyle cried in that. Kyle: Hitch? I didn’t cry during Hitch. Marc: Yeah, Kyle cried during Hitch. Kyle: I didn’t cry during Hitch. I did cry during The Pursuit Of Happiness because doesn’t his â€“ two people die, right? Zach: I dunno, I’ve never seen it. Austin: Yeah, but all of us know it’s just fake. It’s not real, so don’t cry. Kyle: I get emotional, because erm, I dunno, I always put myself in Will Smith‘s shoes. That’s one reason. Marc: What would Will do, you know? Kyle: Yeah, yeah. Every night when we play, or whenever we get together and play ‘Men In Black’ as our band, I feel like Will Smith sometimes. Marc: Yeah, I feel maybe like I’m Will Smith, and I look over and Austin is, erm â€“ what’s his co-star’s name? Marc: Yeah, Tommy Lee Jones. Zach: On that subject, what are your favourite films? Austin: Ahh, have you ever heard of a movie called ‘About Bob’? Austin: No, me neither, but that’s my favourite film. Marc: Super Troopers. It’s a classic. Kyle: I like romantic comedies, but the best movie ever made is Transformers. That’s the best movie ever made. Zach: I’ve not seen that. Zach: If you can only eat one meal or food for the rest of your life, what would it be? Austin: Taco Bell. You don’t know about Taco Bell? Zach: No, no, we don’t have them over here. Kyle: Dude, I can’t even say that ’cause it’s gonna happen, and I want the food. I’d say pizza though. Pizza, pizza, pizza. Zach: What can we expect from you for the rest of 2008? Marc: Well, we’re doing this tour to finish up, then we go back into the states to tour with Cobra Starship. We’ll be releasing ‘She’s A Lady’. Marc: New single, ‘She’s A Lady’, and… you’ll be expecting lots of gifts for Christmas. Austin: In the mail, from FTSK. FTSK Santa is coming. Zach: Erm, that’s about it. Is there anything you wanna say to your fans? Kyle: Oh, absolutely. Erm, erm, hello Kent. I love Bobby. Austin: Give us an I love Bobby shirt. Austin: Oh shoot. G’day mate. Kyle: Er, everyone thanks for buying our album if you bought it. If you haven’t bought it, go check it out on iTunes, erm, it’s awesome. It has bonus tracks and all that snazz, erm. Austin: Hey, do you think maybe we can keep talking ’til his battery dies? Marc: The bonus tracks are there. Kyle: Yeah, the bonus tracks are there. Erm, check us out. Go to our MySpace and add us as a friend, erm. Marc: Send us some messages or comments. Kyle: Send us some messages or comments. Marc: Listen to the songs on MySpace, and see if you like it. Kyle: Erm, print out pictures you see of us on the Internet. Austin: And put them up. Kyle: Yeah, blow them up, magnify them, and put them on your bedroom walls. Austin: Fly to the US and come to all our shows. Kyle: Yep, fly to the US. We will put you on the guestlist, for any show you want, and… that’s it. And with that, the band bid their goodbyes to Zach and Steph before clapping persistently until they had both left the room. However, even after this, the band could still be heard clapping once the door was closed and DEAD PRESS! began to leave. A bizarre, Will Smith obsessed, yet fun band to say the least. NEWS: Forever The Sickest Kids tour the UK next week! NEWS: Forever The Sickest Kids reveal ‘Underdog Alma Mater’ 10-year anniversary vinyl! NEWS: GameChanger release artist-to-fan video games for Miss May I, T. Mills and more! 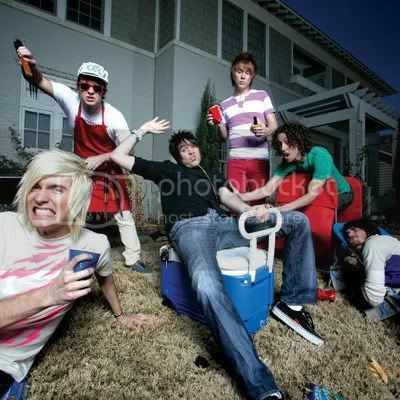 NEWS: Forever The Sickest Kids stream their new self-titled album in full!